Pokuttyan ceramics were made with fusible irony clay (it was subjected to processes of pickling, seasoning and sometimes elutriating) and coated with lead glaze. The ceramics is termed as a half-majolica. Process of manufacturing began with forming on pottery wheel. After setting aside to partial drying a dish's surface was whitewashed, that is coated with a base coat of runny clay burning in white. When the base coat hardened the ornaments were being engraved with a nail set in a wooden handle, then a dish was painted with yellow ochre clay, dried and finally burned and painted again with ceramic paints. Forms of Pokuttyan manufactures reveal extraordinary richness and refer to Neolithic, antique and ancient Greek forms or resemble the pottery of the Lusatian culture. Although there are predominantly vases, jugs with squat, rounded or bulbous convexities, the dishes with longitudinal shapes are also presented. Special attention is attracted by plates, plateaus, jugs and cups representing Kolomyian school and referring to Greek and Tyrolean art as well as candlesticks, clay figurines and articles of everyday use. The wooden manufactures comprises separate group of the collection (cases, plates, carafes, shepherd's axes, knifes). These are decorated with floral or geometrical reliefs and sometimes with intarsia or inlay. Craftsmen who were creators of ceramics usually came from old pottery families. Kuty, Pistyn (Polish: Pistyń), Kosiv (Polish: Kosów) and Kolomyia (Polish: Kołomyja) belonged the main centres of pottery production. Aleksander Bachmiński from Kuty (1820-1882) is regarded as the formal creator of the Pokuttyan style. Michał i Józef Baranowscy, Jan Tymiak, Tomasz and Petronela Napp as well as Jan Broszkiewicz, Piotr Cwiłyk and members of the Koszak and Slowicki families mastered a good technical workshop. A tile stove made in 1849-1851 by Aleksander Bachmiński is undoubtedly the most valuable object of the Pokuttyan ceramics exhibition. The stove belonged to a family of Xawery Dunikowski. When the sculptor died, Aleksander Rybicki obtained and brought to Sanok this pottery object, which, after cleaning, turned into one of the best Bachmiński's work. The tiles are decorated with sacral, floral, geometrical motifs and also scenes from everyday life. There are exhibited many ceramic works of Jan Broszkiewicz, an artist " potter from Pokuttya. There is, inter alia, one meter height amphora decorated with motifs of Goral's 'parzenica' (a motif typical of Polish Highlanders folk art). 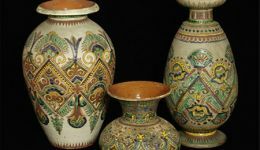 The Napp family ceramics such as jugs and amphorae artistically referring to Greek and Persian patterns can also be seen on the exhibition. Whereas ceramics of Piotr Cwiłyk, reffering also to the antique prototypes, are characterized by high artistic level and rich ornamentation as well as ceramics made in the School of Pottery in Kolomyia. The collection is complemented by gifts of, inter alia, Jadwiga Zalewska from Sanok, Adam Hnat, Czesława Daumuk, Anna and Andrzej Lisiecki and Elżbieta Kisielewska.